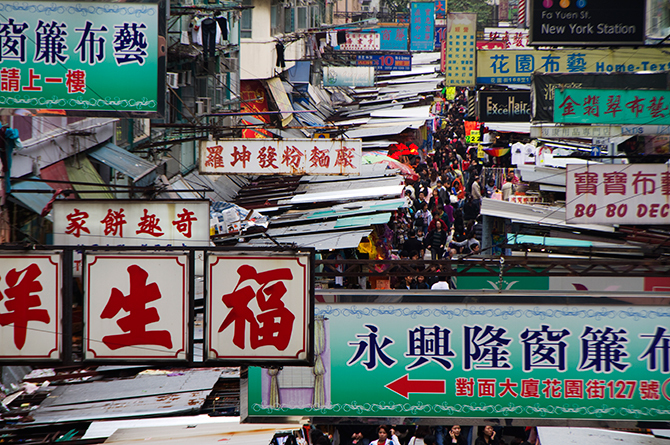 Thousands of people spend Saturday afternoons browsing street markets in the Hong Kong area of Mong Kok. One can find a variety of souvenirs, clothing and accessories in the street markets that often stretch for several city blocks. Cristina Carrascal, a Filipino domestic worker, rides the tram on Hong Kong island to Discovery Bay on her day off. Thousands of female domestic helpers, primarily Indonesians and Filipinos, fill Hong Kong\'s business district on Sundays. For some, this is their first day off in weeks. 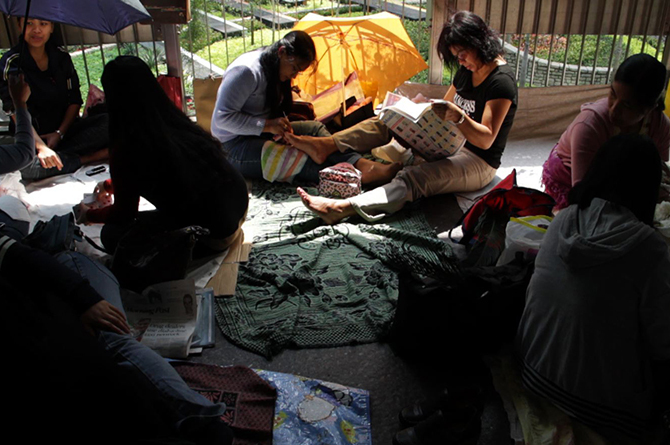 Filipino domestic helpers spend their rest day socializing with friends, reading and playing cards on a pedestrian overpass. Most of the women have little money to spend on entertainment since they send the majority of their wages home to the Philippines to support their families. Cristina Carrascal takes the child she cares for to Tong Fuk Beach, a five minute walk from her employer\'s home on Launtau Island every Saturday. Caring for her employer\'s daughter is Carrascal\'s favorite part of being a domestic helper. Cristina Carrascal and her employer\'s daughter walk home after spending the morning at the beach. Carrascal spends most of her time with the young girl and is teaching her how to speak Tagalog, Carrascal\'s native language. The busy shopping district of Mong Kok, Hong Kong is where many go to shop and find good bargains on everything from electronics to apparel. 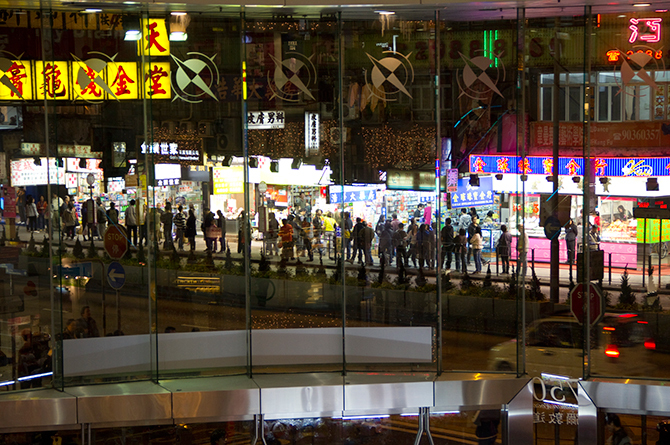 At night this densely populated area is lit with a variety of neon colors coming from signs and store windows. Carrascal carries the child she cares for home from the beach. Carrascal takes on many childcare duties at her job including bathing the girl, feeding her and taking her to and from school, in addition to her household duties of cleaning, cooking and grocery shopping. 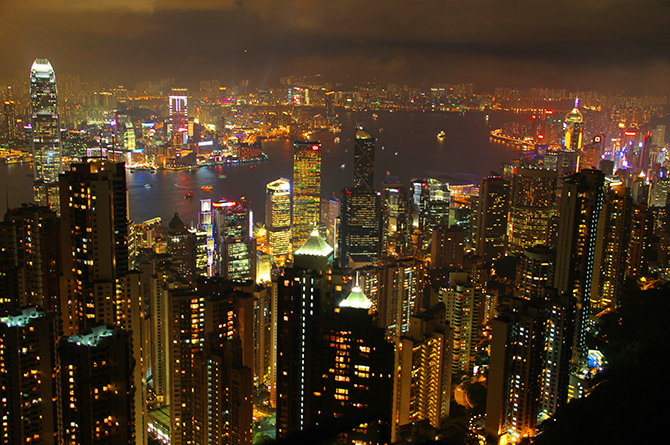 Located on Hong Kong Island, Victoria Peak is a popular tourist destination because of the expansive views of the city and harbor. At night the city is illuminated as the fog often rolls in from the mountaintop. 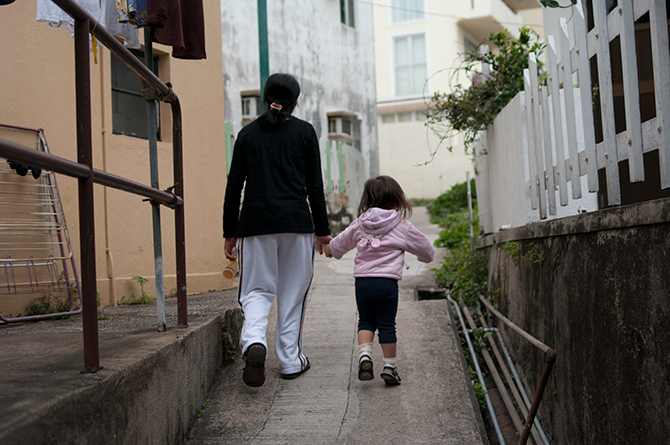 Each year thousands of Filipino women leave home to work as domestic helpers in Hong Kong, most are the sole providers for their families. Often, unaware of their rights, many are mistreated by their employers. 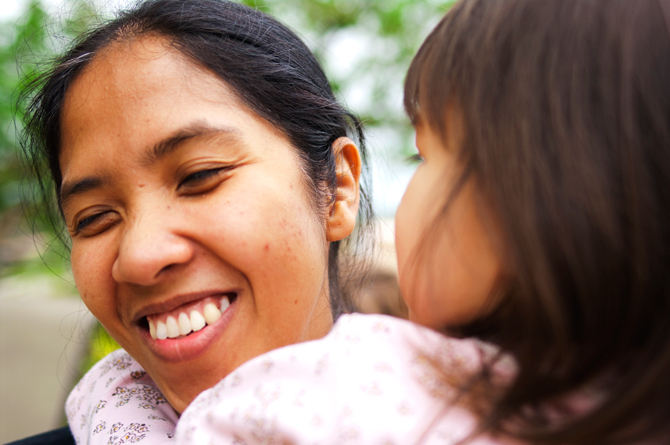 Cristina Carrascal was one of these women, but with the guidance of Helpers for Domestic Helpers (HDH), Cristina sued her previous employer and made a better life for herself with a new employer.